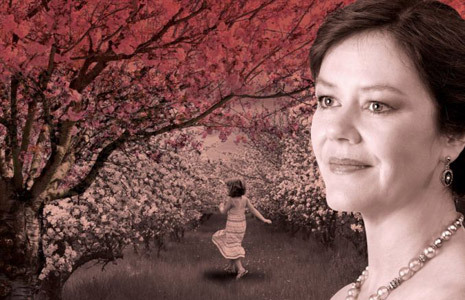 Chekhov’s last play, The Cherry Orchard, is currently running at Birmingham Rep (until November 6th), in a new(ish) English version by Tom Stoppard. I’m a fan of Chekhov, and indeed of Stoppard, so I was really looking forward to this, and in many ways it didn’t disappoint. Josie Lawrence, as Liubov Andreevich Ranevskaya, was every inch the star – she (slightly self-consciously, perhaps) lit up the stage with an emotional performance as a troubled but ultimately courageous woman. Leonard Fenton (Dr Legge in EastEnders!) was humorous and moving as the elderly manservant, Firs, while John Ramm was suitably irritating as Lopakhin, moving the plot, and indeed the tragedy, if it can be termed such, along. The governess, Charlotta, played by Joyce Henderson, was probably my favourite part, though – with her unlikely background, she draws on magic tricks to deflect attention from her isolation, and embodies Nabokov’s comment that “Things for him [Chekhov] were funny and sad at the same time, but you would not see their sadness if you did not see their fun, because both were linked up”. The set was perfect, if somewhat bare: it suggested, to me, the peeling decay of a house aware it was to be deserted and demolished, but it could have done with more signs of the still-present family, as the perceptive review in The Telegraph suggests. Stoppard’s script was often sparkling, sometimes a little slow and sometimes a bit too much of a departure from Chekhov (Yasha telling Dunyasha that she “got on his wick” was definitely a jarring note for me), but the performance culminated in the leaving of the cherry orchard in a genuinely moving scene that nearly had me in tears. Anya’s enthusiasm for a future free of the past, encouraged by Trofimov, was beautifully done, contrasting with her mother’s understandable reluctance to leave behinbd her family home. Chekhov’s play demonstrates the insecurities of his time, and the coming of a new order of nouveau-riche as aristocratic families were forced to sell their ancestral homes. As such, it both looks to the future and reflects upon the past, and Stoppard’s text demonstrates this nicely. This isn’t a definitive performance of The Cherry Orchard, by any means, but it is a version that’s worth seeing.